"She's my girl. You can't take my girl away from me." 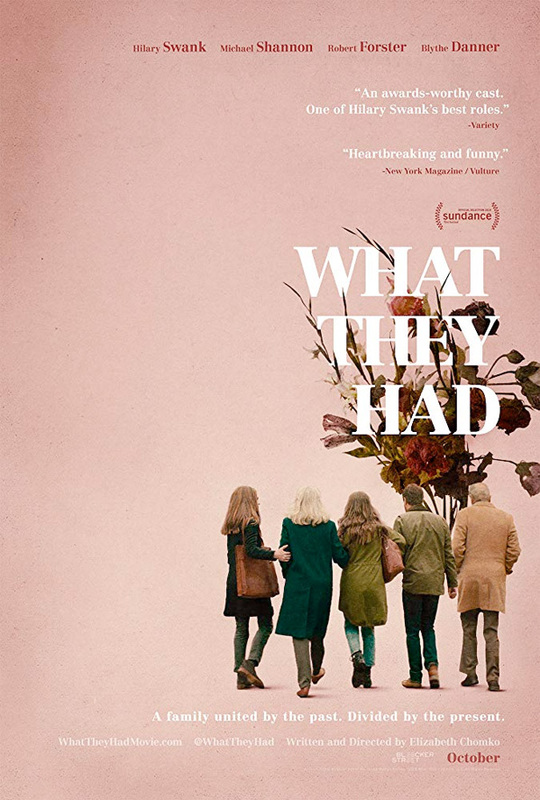 Bleecker Street Media has released an official trailer for an indie drama titled What They Had, which first premiered at the Sundance Film Festival earlier this year. From first-time filmmaker Elizabeth Chomko, this heart-wrenching drama tells the story of a family that comes together one winter in Chicago, trying to figure out what to do with their aging mother who has Alzheimer's and suddenly leaves the apartment one snowy night. Hilary Swank stars, along with Michael Shannon as her brother, and a cast including Blythe Danner, Robert Forster, Taissa Farmiga, Josh Lucas, and Aimee Garcia. The film had mostly mediocre reactions at Sundance, even though it's a very powerful, personal story with some good performances. Might connect with a few people more than others. Elizabeth Chomko's What They Had centers on a family in crisis. Bridget (Hilary Swank) returns home to Chicago at her brother’s (Michael Shannon) urging to deal with her ailing mother (Blythe Danner) and her father’s (Robert Forster) reluctance to let go of their life together. What They Had is both written and directed by American actress-turned-filmmaker Elizabeth Chomko, making her feature directorial debut. This first premiered at the Sundance Film Festival earlier this year. Bleecker Street will release Chomko's What They Had in select theaters starting October 19th this fall. First impression? Who's interested in it?